We have been using the Telstra mobile network for 8+ years, way better coverage than any other provider - if you need it. 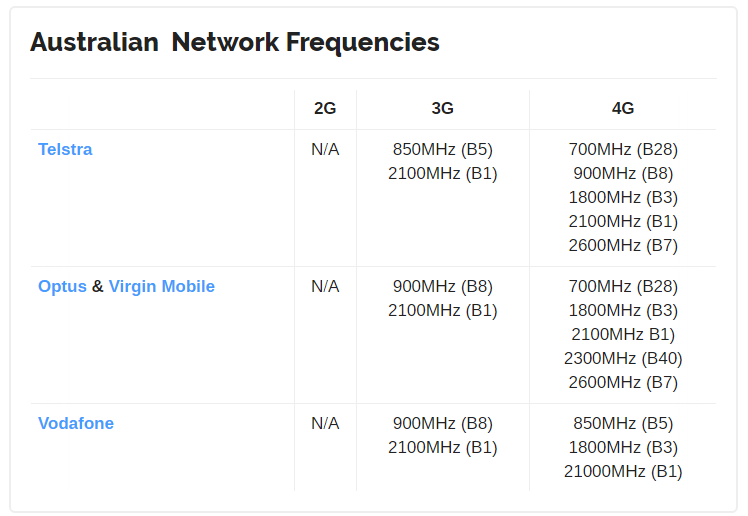 Your phone manufacturer can present supported frequencies in a number of different ways, but in a spec sheet you want to look for UTMS or HSPDA for 3G networks, and FDD LTE for 4G networks. We have been using the Telstra mobile network for 8+ years, way better coverage than any other provider. This is one of the very major ones imo. You can get passed around several times before you get to one who knows nothing about it and you have to go through the whole process of explaining the issue once again to them, only to find they can't help. I think in recent years though it probably has improved. unfortunately I find it to be the opposite. in recent years as Telstra has progressively outsourced all of the customer contact functions overseas, not only do individual departments not know what the other ones do, but the people inside the departments don't even understand their own jobs properly. something to do with not actually wanting to have to train people anymore, or valuing experience, and believing that scripts can solve everything required. problem is they layout roadmaps and plough on regardless of whether or not they are where they predict they will be. then other people jump in on top of all that and nip and tuck. whole place is a mess. if their expectation is that the result will ever be other than shithouse using their current methodology then they are doomed to fail. this has observably been both the delusion and the result for years now, but until they lose enough customers for their senior management to admit the problem exists, I doubt very much the situation will improve. the solution from the customer's point of view is to get out. nah, they are just trimming back and building up a cash reserve to buy the NBN come what is it 2022 or something for pennies on the dollar. then business as usual, not that that isn't business as usual. Well I find doing things online they retain the chat and the next consultant generally reads through the chat before responding. During my phone calls in the past I had to start from scratch with the next consultant. If it’s not too much bother any chance you can have a look to see wtf is up with the nevertire tower? The 4G keeps dropping out the the 850mhz 3G is flaky as hell too. nah, they are just trimming back and building up a cash reserve to buy the NBN come what is it 2022 or something for pennies on the dollar. I have no doubt this is the plan, along with pressuring the government for very favourable sale and ongoing operating terms, as they will be the only organisation cashed up enough to take it off their hands. that goes some way towards surmounting the language barrier, but not the understanding one. if you'd like a recreational impossibility, try finding someone that understands the difference (or even the existence of) an unlisted number, as opposed to a silent one. our current AE is flat out remember what acronym to use and often mixes the letters up, let alone knowing what any of them mean. Gee wonder if they were hired for sales instead of you know being useful. I certainly don't doubt it. Did they change their note taking system or user management system a few years back? They never used to be able to find notes on my account but now everything always seems available. no idea. I listened to my wife spend a hour on the phone two to three times a week for nearly six MONTHS recently (not an exaggeration in the slightest) trying to get a simple voice service installed for a family member, during which time we went through innumerable script readers and SIX complaints toadys. none of whom seemed to have any idea of what had been said or done before, and needed retraining every time just to educate them as to what the issue was, and what needed to be done. and that was with me looking on the NBN systems from my end and TELLING them what to do, and then watching as they screwed it up yet again - followed by 24 hours for their idiotic CRM system to cancel the order so they could make the same mistake over and over and over. yeah i don't put that much effort in anymore on consumer, i just ring, escalate to a supervisor on the call if not happy and then inform the supervisor that the next call will be to the TIO - and then if necessary actually call the TIO. Works great! Because the person who rings back is from the specialised we fucked up dept. that works great as a customer. it doesn't work when trying to become a customer.